How do I find or play matches on smash.gg? View or play (online) your upcoming matches. For more information, check out Playing Online Tournaments on smash.gg. View your bracket information, including bracket links, scheduled times, and more. Manage your registration: update attendee information (name, prefix, location), register for additional events, and manage your team (link). Go to the tournament page you've registered for. Click the Manage button on the top right of the tournament page (the Manage button will only appear once you've registered for a tournament). 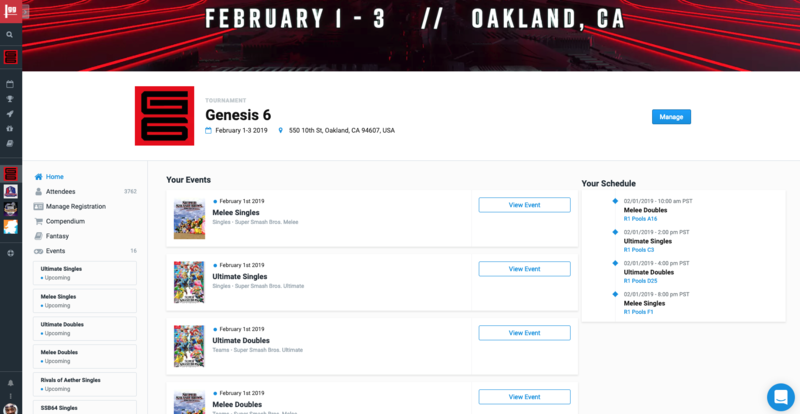 As a bonus, matches are now displayed on the homepage of the tournament page once you have registered to a event and the TO has made the brackets and seeding visible from their end! For any other questions or concerns, feel free to email us at hello@smash.gg.